The Sikh Reference Library, which suffered extensive damage during Operation Bluestar, is on its way to salvage its past glory with the SGPC modernising and digitising the library. The library boasts of around 400 manuscripts of Guru Granth Sahib, over 800 other manuscripts and 21,000 books. The digitisation work is being carried out by the SGPC in collaboration with the Punjab Digital Library, Mohali, owned by the Nanakshahi Trust. A special facility has been set up on the library premises to digitise rare manuscripts in a proper manner. Two modern cameras have been installed to digitise these manuscripts. The procedure allows the digitisation of around 1,000 pages daily or even more with each camera, depending upon the condition of a manuscript. The library has manuscripts that are as old as 300 years while the oldest book dates back to 150 years. The library is also getting photocopies of rare books from the National Library, Kolkata, and Punjabi University, Patiala, before subjecting them to the process of digitisation. It is also digitising three English, six Punjabi and two Hindi newspapers. It has been preserving The Tribune since 1927. Once the digitisation work is complete, scholars and researchers would simply need to switch on a computer in the library to access its entire treasure trove of knowledge. 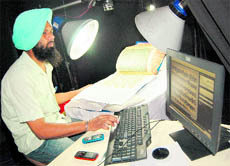 The SGPC has allotted Rs 39 lakh for the digitisation of the library in its annual budget for 2011-12. After the digitisation of the entire library, the SGPC intends to open sub-offices of the digital library at Gurdwara Dukh Niwaran Sahib in Patiala and Kalgidhar Niwas in Chandigarh to facilitate scholars and researchers. The library has undergone expansion and modernisation in the recent past. It is now equipped with computers, scanners, printers, ACs and even a fumigation chamber to preserve books. Interestingly, though the library is located in the Golden Temple complex, it is not an easy job for anybody to locate it, thanks to its “odd location” and lack of signboards. SGPC Secretary Dalmegh Singh Khatra said they would soon put up maps of the Golden Temple complex on both the entrances. He said the digitisation would ensure the preservation of rare manuscripts and books for posterity even in case of any untoward incident. Regarding the SGPC’s claim that the Army had taken away a huge number of rare manuscripts and books from the library post-Operation Bluestar, he said they had been pursuing the matter with the government for long to get those books back, but their efforts had drawn blank. Post-Operation Bluestar, while the Army authorities claimed that the library had caught fire during an exchange of fire with militants, the SGPC accused the Army of deliberately setting the empty library afire after taking the rare and invaluable material away. SIKHNUGGET: Many of the manuscripts and books claimed to be have been taken by the Indian Government is not true. This is backed up research on the serial numbers of the manuscripts and incorrect logging of manuscripts in the first place.